For the past week I’ve been wearing a wrist brace in order to let it heal properly. For several months now, I’ve been dealing with a nagging soreness when I flex my left wrist too far in either direction. I think I originally injured it lifting a suitcase in the summertime, and I have kept injuring it with regularity since then, so it never gets a good amount of time to heal. The pain is not too bad, but there are certain times when it hurts more, such as when I stretch for some keyboard shortcuts in Photoshop (like ctrl+t), reach back for the seatbelt, or play the ukulele. The Vive wrist brace is sized pretty small, so I think anyone with larger hands will find it uncomfortable. My wrist is 6 3/4 in diameter, which is on the skinny side, and it’s pretty snug. 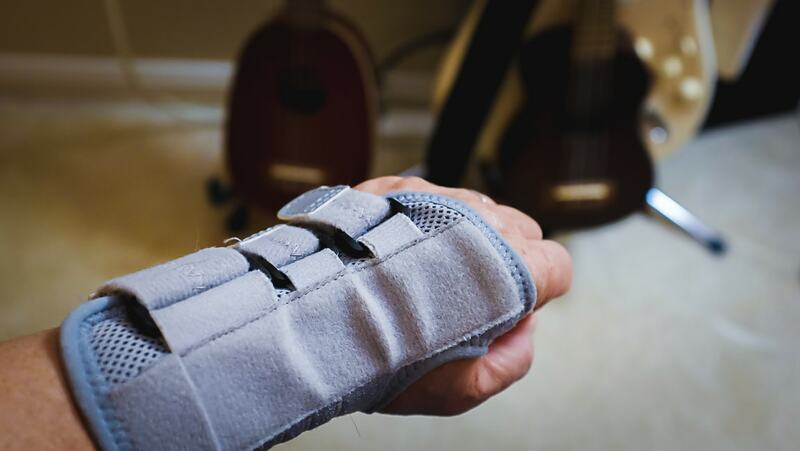 The brace has three adjustment straps, and I like to leave it loose, which is comfortable but gives me adequate support and warning when I bend my wrist near the limit when it would begin to hurt. Also, the brace is great for helping me play my Kala ukulele with better form. One of the reasons why my wrist has not healed is that I used to strain it almost every day due to my bad fretting form. But playing while wearing the brace keeps my wrist straight (and forces me to bend my fingers more) which is so great! In fact, the wrist brace might be a good idea for anyone who wants to improve their bad form. I never see your posts in my box, so I just unfollowed and followed back to enable notifications! Also, I hope that hand heals soon. Go easy on it!